I am really having to pinch myself at the extent of my good fortune at the moment. 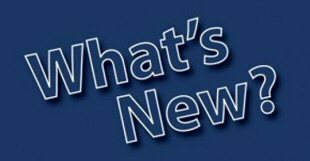 Not only do I have my own blog that affords me some incredible dining opportunities, but I have won a competition for a meal for 2 at an Indian restaurant in Derby! 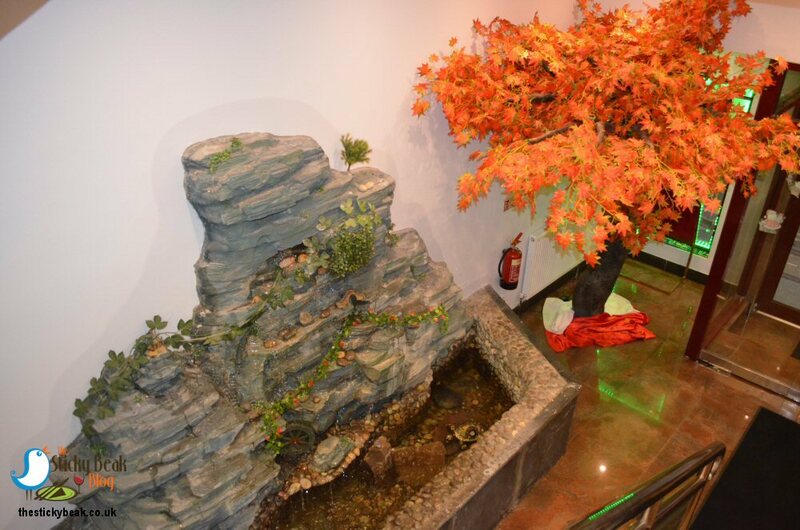 Fusion of India is an establishment that is about 15 months old, so still in its early days really, and their social media page had a competition to win a meal for 2 on their Early Bird special menu. I entered (as you do! ), not expecting anything from it, so was absolutely thrilled when the notification came through saying I’d won. 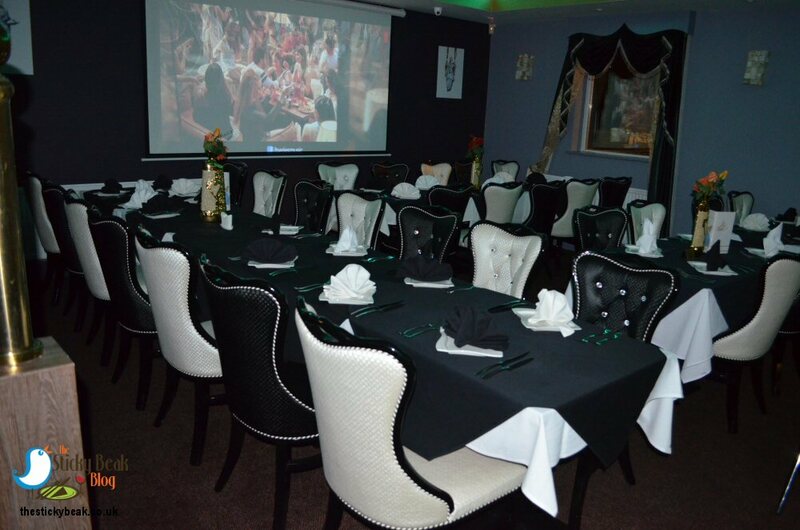 The Early Bird offer runs Monday – Saturday 5-7pm, and for £14.99 per person you can have (from a specified selection) a starter, main course with butter Naan, steamed rice or chips, and either a tea, coffee, Ice Cream, or Gulab Jamun for dessert. A glass of house wine or small lager is included in the price too. 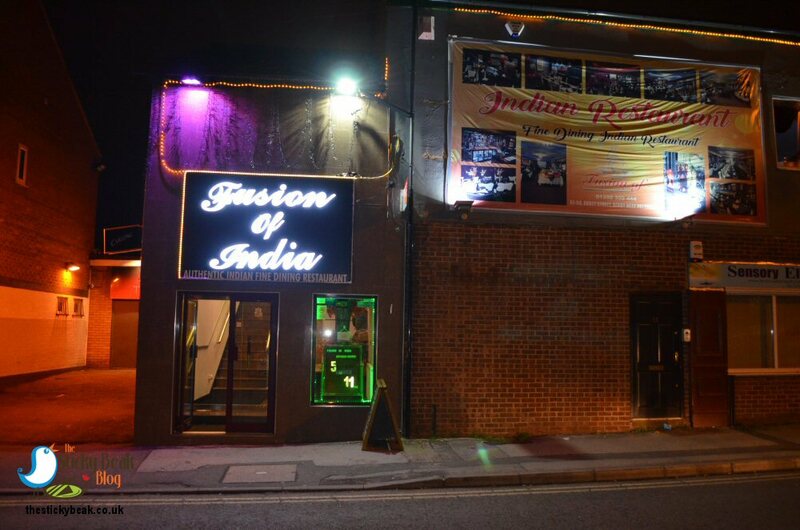 Fusion of India is more than noticeable from the street, with its curtain of flashing lights and neon sign, but seeing as the restaurant is located upstairs you do need to be really visible from ground level. Up the stairs we went, admiring the water feature, foliage, wall mural, and equine sculpture that line the way to the main space. A warm welcome was given to us as we entered the restaurant and we were shown to our table straightaway, despite being earlier than our reservation time. 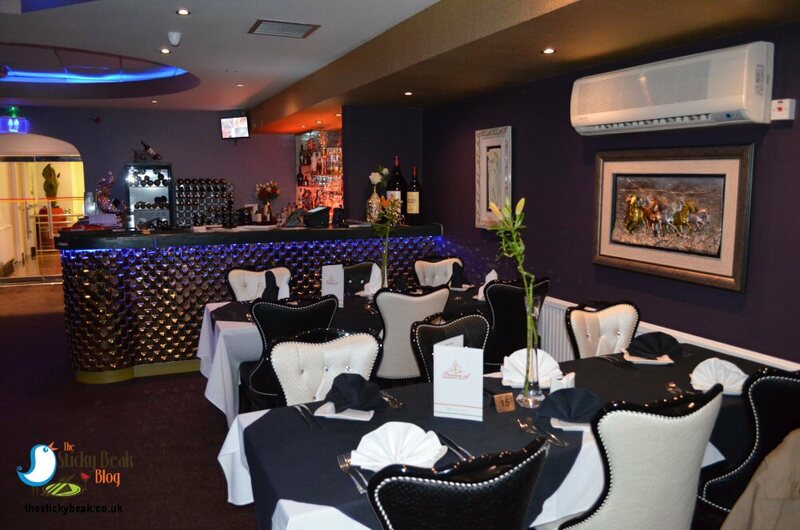 There were already people in taking advantage of the early bird offer, including one family with a baby in a highchair; family dining is clearly catered for at Fusion of India. When we go out for an Indian meal, our habit is to kick off with Poppadoms and Pickle tray, and we saw no reason to deviate from this plan. 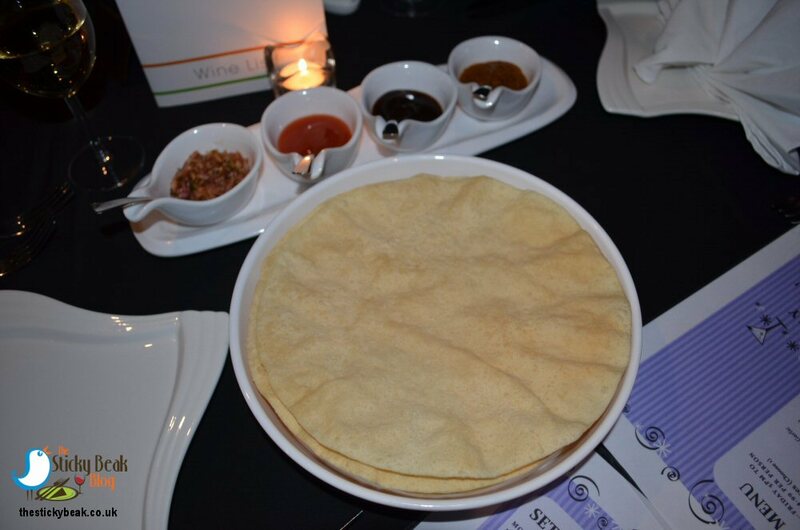 Clearly we were paying for any extras, but that didn’t bother us, so we had a couple of plain poppadoms each. When the nibbles arrived I noticed that the pickle tray was different to others that we’ve had; good old Mango Chutney was there, as was the Onion salad, but no Raita in sight! Instead, there was a Tamarind dip and Fusion of India’s own secret sauce which is made with no less than 21 ingredients! I love Tamarind anyway; its sweet/sour/spicy character always gets my taste buds tingling. The secret sauce though truly was something magical with its spicy notes being a mix of hot, sweet, earthy, and sharp; it was delicious. 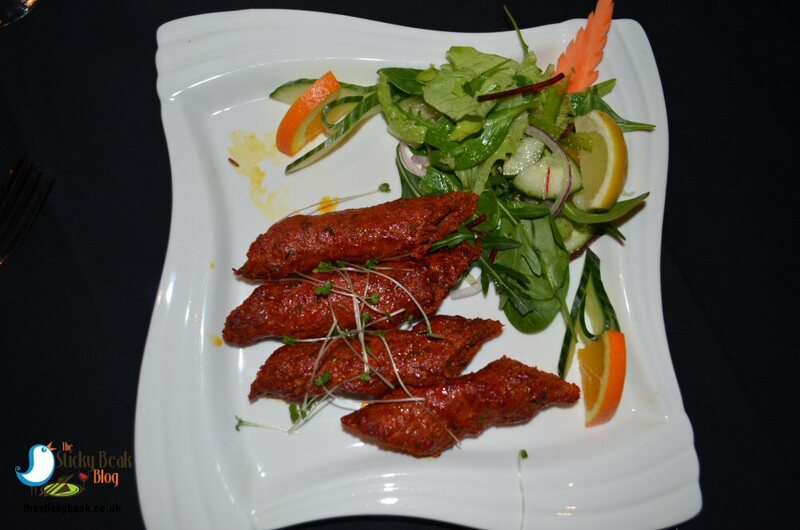 For starters I had ordered the Hot Garlic Fish and The Man Bird had the Seekh Kebab. There is an certain (misguided usually) belief that portion sizes are smaller on special meal menus, certainly a chap on the next table with his family thought this would be the case, but not at Fusion of India! My Hot Garlic Fish was a more than generous size; it was a whole fillet of fish that had been cut into pieces, battered and softly fried. There was a definite lip tingle factor going on by the time I’d finished it all, so not unpleasantly hot by any means and more than doable for those who can tolerate mediumly spiced curries normally. I loved the attention to detail that had gone into this dish –the shell shaped platter was a nice touch and the salad was colourful and carefully placed in the dish. An assortment of vegetable carvings had been interspersed with the Fish and salad, and Orange and Lemon segments provided a final touch. The Boy Wonder was also won over by his Seekh Kebab. A quartet of 4-5” long kebabs had been carefully laid side by side and they all had a beautifully fragrant spice note to them. His Nibs said the meat used was of good quality, so the “repeat factor” was nice and low; to be honest this is what puts me off trying Indian kebab dishes on a lot of occasions, so it’s a good bit of info to know. 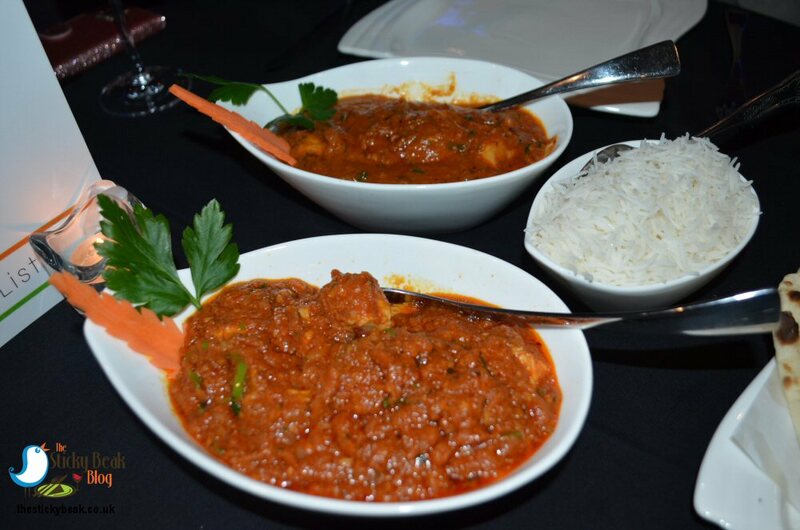 I had gone for Chicken Balti as my main course dish, and the server asked if I preferred it medium or hot; I erred on the side of caution and chose medium, having never eaten at Fusion of India in Derby before. Him Indoors fancied the Garlic Chilli Chicken, and we had a portion of rice and a Butter Naan so that we could share amongst ourselves. As with the starters, the main courses were very generous in size and there were plenty of moist Chicken breast chunks in both curries. My Balti had a lovely rich sauce to it that was perfectly medium in spiciness –there was a slight tingling in my mouth by the end, but nothing more. A great assortment of vegetables were also in the curry, so although there was plenty of sauce there was a corresponding amount of meat and veg in there too. 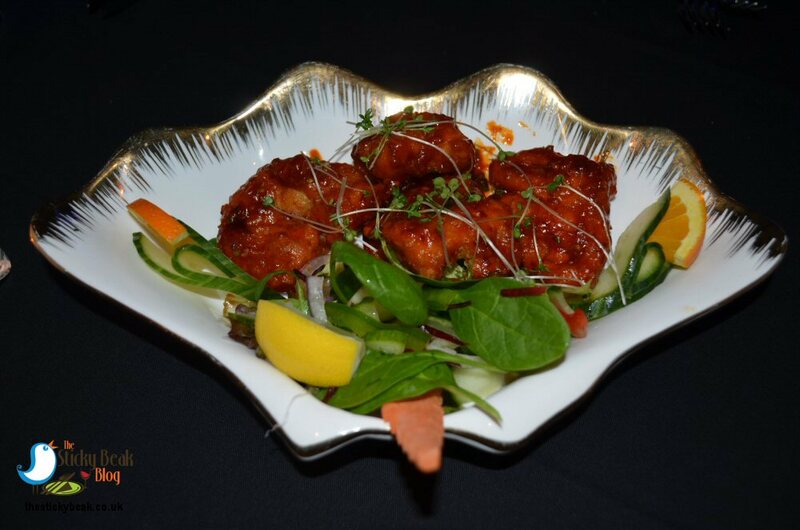 Garlic and Chilli are renowned for combining to make more robustly spicy dishes and they didn’t disappoint in Fusion of India’s Chicken dish! The Man Bird gave his curry a 7 on the tingle-o-meter, making it definitely closer to hot than medium! He had a well defined prickling sensation on his lips and tongue by the end of the meal; not enough to have him reaching for a jug o’ dog (Lassi (e) – those of a certain age will get the pun! ), but enough to be noticed. Luckily flavour hadn’t been sacrificed at all despite the enhanced spiciness of the Garlic Chilli Chicken. 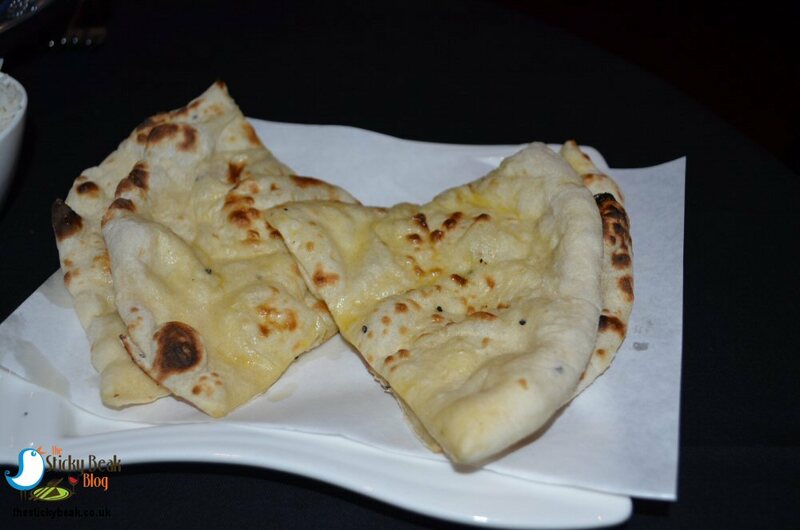 Freshly made Butter Naan wasn’t only deliciously buttery, it was soft and luscious and absolutely stunning to eat. Both The Man Bird and I used its gentle folds to scoop up our curry sauces, eager not to waste any of the deliciousness before us. The other accompaniment, Steamed rice, had also been nicely done; each grain had been separated and was lovely and fluffy to eat. Throughout our evening all the team had been very polite and attentive, asking if our food was to our liking and refreshing drinks as and when needed. The Man indulged in a pint of Cobra, well it was the weekend! I paid a visit to the “facilities” and whilst they were averagely basic they were completely free of any associated odours – and I mean completely free. There was plenty of paper in both cubicles and the hand soaps were full as well. Sometimes these things can make all the difference, y’know! Plenty of takeaways were being collected, and there was a steady stream of diners arriving as we dined, so clearly Fusion of India has a reputation for good food. One of the Chefs has previously worked at Anoki though, so no surprise really that the dishes are so tasty. 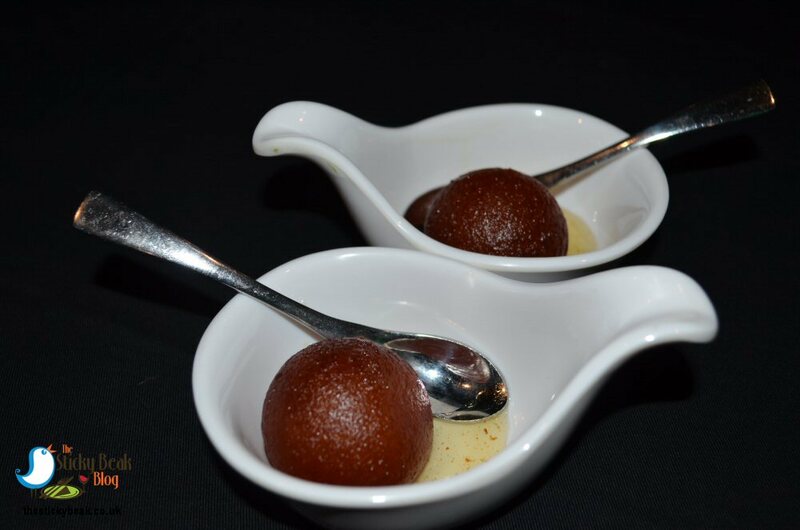 The pair of us are fans of the supremely sticky, syrupy treat that is Gulab Jamun so when we’d spied it on the menu at the start of the evening, there was no way we weren’t having it! At Fusion of India this dessert is freshly made to order and the little balls of yumminess were piping hot as we cut into them.A good deep layer of hot, sweet syrup completed the dish, and we greedily spooned plenty of it over the spheres before gobbling it all up! There’s just no finer way to end an Indian meal than this, in my opinion. Hot Wings given here and thank you Lady Luck for being on my side in the competition!.